More Volvo XC90 photos to go along with Michael's review. Front view connotes quiet strength. "Thor's hammer" DRLs. More going on with the new XC90's tastefully restrained sheet metal than initially meets the eye. Sophisticated evolution of Volvo's traditional brick. The new Audi Q7 should look this good. The Acura MDX (2014 here) isn't unattractive, but it doesn't look nearly as upscale as the Volvo. Excellent proportions for a vehicle with a transverse engine and transmission. The new XC90 appears especially handsome from the rear quarter. Nicely formed shoulder. In my first encounter with the new XC90, this interior blew me away. The Acura MDX's interior isn't in the same league as the Volvo's. With the Inscription trim, the XC90's entire instrument panel is covered in leather and walnut. Many features, few buttons. Touchscreen enables minimalism. 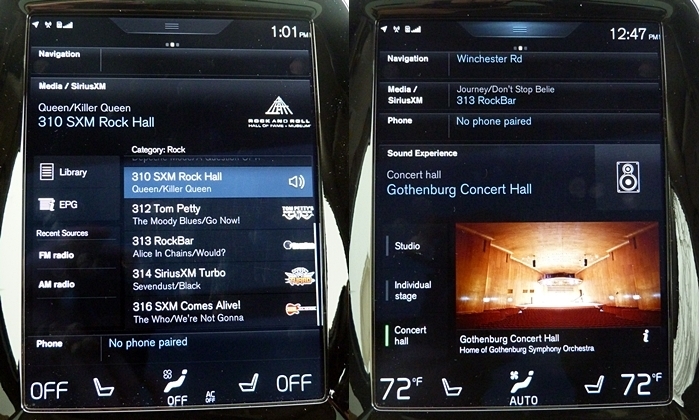 LCD instruments vary by mode (Eco replaces the tach with an efficiency meter) and theme (1 of 4). Like a phone, swipe side to side to change screens, tap an area to expand it. Gnurled controls. Don't care for the linear walnut? Aluminum and carbon fiber are also available. Many adjustments, but still not as comfortable or as form-fitting as I expected. Comparable second-row legroom to the MDX, but 2.6 inches less shoulder room despite wider exterior. Based on the specs, four more inches of third-row legroom than the MDX. In reality, maybe two more. More room behind the third row than in most competitors. Still not enough for a traveling family. As in competitors, far more cargo space with the third row folded. Second row folds 40/20/40. With both rows folded, seven feet of floor.